The popularity of text messaging is growing every year, and many employees and their clients now expect to use it as a tool to conduct business. 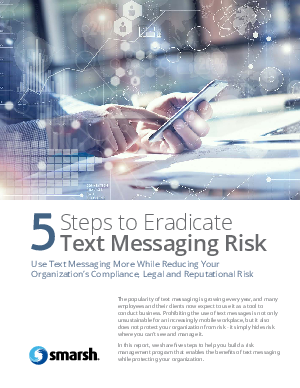 Prohibiting the use of text messages is not only unsustainable for an increasingly mobile workplace, but it also does not protect your organization from risk - it simply hides risk where you can’t see and manage it. In this report, we share five steps to help you build a risk management program that enables the benefits of text messaging while protecting your organization. Download now!